For the Chinese folk tale, see Lady Meng Jiang. Mengjiang (Mengkiang; Chinese: 蒙疆; pinyin: Měngjiāng; Wade–Giles: Meng3-chiang1; Hepburn: Mōkyō), also known in English as Mongol Border Land or the Mongol United Autonomous Government, was an autonomous area in Inner Mongolia, existing initially as a puppet state of the Empire of Japan before being under nominal Chinese sovereignty of the Reorganized National Government of the Republic of China from 1940 (which itself was a puppet state). Formed in 1939, it consisted of the then-Chinese provinces of Chahar and Suiyuan, corresponding to the central part of modern Inner Mongolia. It has also been called Mongukuo or Mengguguo (or Mengkukuo; Chinese: 蒙古國) (in analogy to Manchukuo, another Japanese puppet state in Manchuria). The capital was Kalgan, from where it was ruled by the Mongol nobleman Prince Demchugdongrub. 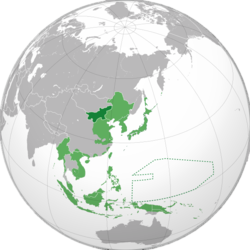 The territory returned to Chinese control after the defeat of the Japanese Empire in 1945. Following Japan's occupation of Manchuria in 1931 and the establishment of the puppet state of Manchukuo, Japan sought to expand its influence in Mongolia and North China. In a series of actions, starting in 1933, the armies of Manchukuo and Japan occupied Chahar and in 1936 proclaimed itself the independent Mongol Military Government, allied with Japan under Prince Demchugdongrub. In 1936 and 1937, similar operations in Suiyuan saw the occupation and absorption of that province also. Formed on May 12, 1936, the Mongol Military Government (蒙古軍政府) had Prince Yondonwangchug of Ulanqab as its first chairman. It was renamed in October 1937 as the Mongol United Autonomous Government (蒙古聯盟自治政府). On September 1, 1939, the predominantly Han Chinese governments of South Chahar and North Shanxi were merged with the Mongol United Autonomous Government, creating the new Mengjiang United Autonomous Government (蒙疆聯合自治政府). The capital was established at Zhangbei (Changpei), near Kalgan (Zhangjiakou), with the government's control extending around Hohhot. 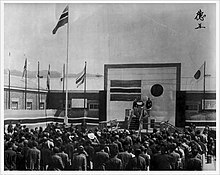 On August 4, 1941, it was again renamed: the Mongolian Autonomous Federation (蒙古自治邦). In 1939 Wang Jingwei reorganized the remnants of the occupied Chinese government for a Japanese puppet state which was a totalitarian regime, which is now so aptly commonly referred to as the Wang Jingwei Regime, in the nominal capital Nanjing (Shanghai was the de facto capital). Mengjiang was incorporated into the regime in 1940, though it remained completely autonomous. Mengjiang capitulated in 1945 when it was invaded by the Soviet Red Army and Mongol Red Army as part of the Manchurian Strategic Offensive Operation. Most of the area, with the notable exception of Kalgan, is now part of Inner Mongolia in the People's Republic of China. The Reformed Government's territory in central China from 1937 until 1940 when all three states, Mengjiang, the Provisional Government of the ROC (not to be confused with the 1912 government of the same name and flag) and the Reformed Government of the ROC, merged into the Reorganized National Government of the ROC. Demchugdongrub: Khungtayji Head of State; Commander of the Mongolian Military Command Headquarters. 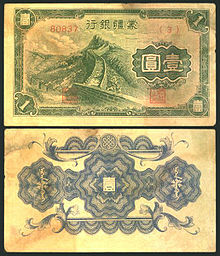 The Japanese established the Bank of Mengjiang that printed its own currency without years on it. Some traditional local money shops also made currency with the Chinese year numbering system, such as the Jiachen Year (甲辰年), on it. The Japanese had mineral interests in their created state of Mengjiang. In one example the Japanese put the iron mine in Xuanhua Longyan into production, with a reserve of 91,645,000 tonnes in 1941; and analyzed the reserves of coal in land, one was 504 tonnes, and another with a potential production of 202,000 of tonnes (1934). The Mengjiang iron deposits were exported directly to Japan. At the same time, the Japanese sought the coal reserves of Suiyuan (another Mengjiang occupied sector), including one of 417 million tonnes, and one with a potential extraction of 58,000 tonnes in 1940. The Mengjiang National Army was the Japanese created "native army" organized in Mengjiang; not to be confused with the Mongol Army. It was a Kwantung Army special force group under direct command, having native commanders alongside Japanese commanding officers, as in other auxiliary outer sections of the Kwantung Army. 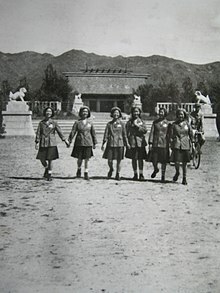 The purpose of the army was to support any eventual Japanese operations against Outer Mongolia (Mongolian People's Republic), or the north China areas, and to act as a local security force, with the local police forces. It also had the duty of protecting Prince De Wang, the head of state, and the Mengjiang native establishment and local government properties. The army was equipped with rifles, pistols, light and medium machine guns, mortars and some artillery and anti-aircraft guns. It was organised as a mobile cavalry and light infantry force with little artillery support and no tanks or aircraft. In 1936, the Inner Mongolian Army was armed with Mauser rifles and they had 200 machine guns: mostly the Czechoslovak ZB-26 and a few Swiss Sig. Model 1930 submachine gun for Teh Wang's 1,000 bodyguard troops. They had 70 artillery pieces, mostly mortars and a few captured Chinese mountain and field guns of a variety of types (making ammo and spare parts a problem). The few tanks and armored cars were captured Chinese vehicles crewed by Japanese. After the Suiyuan Campaign, the Mengjiang National Army was rebuilt from the defeated remnants of the Inner Mongolian Army, the new eight Mongol cavalry Divisions were 1,500 men strong, in three regiments of 500 men. Each regiment were to have three Saber companies and a machine gun company of 120 men. However these divisions actually ranged in size from 1,000 men to 2,000 men (8th Division). In 1939, the ethnic Chinese troops in the Mongol Divisions were brigaded together in the 1st, 2nd and 3rd Divisions and turned into the 1st, 2nd and 3rd Ch'ing An Tui Brigades of the "Mongolian Pacification Force" and used against various guerrilla groups. In 1943, the Mongol 4th and 5th Divisions were combined to form a new 8th Division and the old 7th and 8th Divisions formed the new 9th Division. Strength of the army was between 4,000–10,000 men, all cavalry at this time and had little heavy equipment. The Mengjiang state also had 5 Defense Divisions in 1943, made up of local militia and other security forces, nominally of three regiments. Apparently only one of these regiments in each division was capable of operations. In 1944, the Japanese reorganized them along with the Chahar garrisons into four Divisions of 2,000 men each. At the end of the war, a total of six divisions (two Cavalry and four Infantry), three Independent Ch'ing An Tui Brigades and a "Pao An Tui" Security Force Regiment made up the Army. The sole secondary language which could be taught in schools was Japanese while students were forced to pay respect to the Emperor of Japan and Shintoism. The government and army of Mengjiang were complete puppets of the Japanese. Wikimedia Commons has media related to Mengjiang. ^ 山西通志: 政务志. 人民代表大会, 政府篇, 政治协商会议. 中華書局. ^ "Mengkukuo/Mengjiang". Global Security. January 7, 2012. Retrieved June 16, 2017. ^ George F. Botjer (1979). A short history of Nationalist China, 1919–1949. Putnam. p. 180. ^ Stephen R. MacKinnon (2007). China at War: Regions of China, 1937–1945. Stanford University Press. pp. 166–. ISBN 978-0-8047-5509-2. ^ Stephen R. MacKinnon (2007). China at War: Regions of China, 1937-1945. Stanford University Press. pp. 168–. ISBN 978-0-8047-5509-2. Jowett, Phillip S. Rays of The Rising Sun, Armed Forces of Japan's Asian Allies 1931–45. Volume I: China & Manchuria. Solihull: Helion, 2004. Lattimore, Owen. "The Phantom of Mengkukuo." Pacific Affairs 10, no. 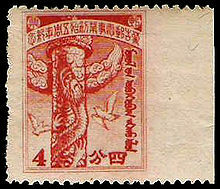 4 (1937): 420–27.